As much an icon of New York as the Empire State Building, Yankee pinstripes or, indeed, the very spires of St Patrick's Cathedral, yesterday's passing of Ed Koch – the ever-colorful liberal Democrat who served three terms (1979-90) as Gotham's mayor – is being mourned in church circles like we're City Hall, and not without reason. As this beat goes, one personal story seems to sum it up well.... Passing through Midtown several years back, this scribe was able to visit the crypt of St Patrick's to pray at the tomb of my countryman, the great and mighty John O'Connor, whose titanic witness and simple goodness remain immensely vivid and so terribly missed among those who knew and loved him, even almost 13 years now since he was called from us. Anyways, going through the doors and down those steps, past Fulton Sheen's predieu to stand before the marble wall in which the archbishops of New York are entombed, one thing was immediately striking – a line of pebbles straight across the ledge in front of O'Connor's marker; seven, eight, maybe nine of them. "Ed Koch – all of them." 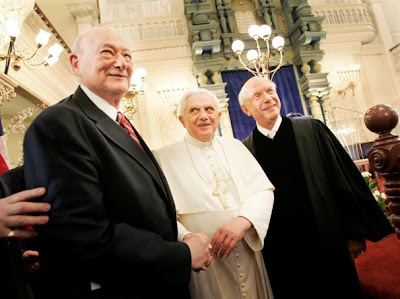 Having penned a 1989 book of conversations with the cardinal – and been a signatory to the deed by which the prelate took possession of his titular church in Rome, Saints John and Paul on the Coelian Hill, "New York's own" going back to Spellman – Koch said he "loved [O'Connor] like a brother." For his part, meanwhile, during the homily at his 1984 installation, the new archbishop of the "capital of the world" marked out his own style in Hughes' chair by donning a Yankee hat in the cathedral's high pulpit and, as the cameras rolled, asking Koch's signature question back at him: "Mr Mayor, how'm I doin'?" Long after Koch left Gracie Mansion, the duo continued having breakfast at least every two months. 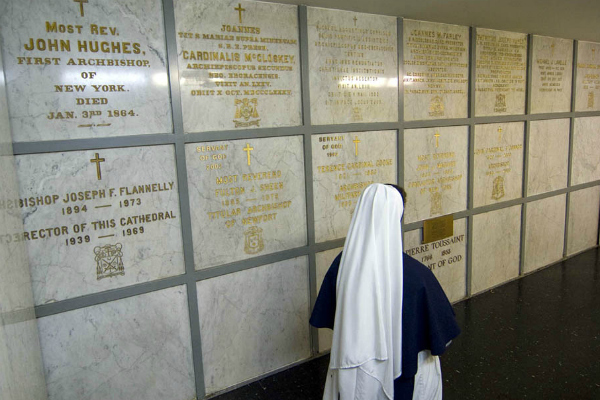 Following O'Connor's death, his "brother" quietly kept up those visits with the cardinal, only then to pray and bring the stones for his grave. In that light, it shouldn't be forgotten, either, that precisely when Uncle Jack couldn't did Koch take it on himself "to go where angels fear to tread" and defend O'Connor's own – as the mayor put it in a book at the time, "while he committed his sin, everybody commits sins; and you have some appropriate punishment, but you don't destroy them!" In the mayor's memory, Cardinal Timothy Dolan has posted an introduction of himself given by Koch last year, at which the politico movingly recalled his relationships with each of the last four occupants at 452 Madison. As the Cardinal-President noted in his personal tribute, whether at Christmas in the Cathedral or October's Al Smith Dinner down 50th Street, "the largest ovation invariably went not to the evening’s guest speaker, not to the Archbishop of New York, but to Mayor Koch." And now, led by the old friend who's been waiting 13 years for another breakfast, may the angels cheer him into Paradise.